“Supply Side” economics has always been a fancy term that sounded like a plan. It was popular in the 1980s because it seemed to work – but very few people ever understood that it worked for the wrong reasons. It was, at least in practice, the old Keynesian theory dressed up in a suit and ready for a white-collar world. It’s time to call this for what it is – a political con – and to put it to rest. It was called “Supply Side” because it was supposed to be the answer to the old Great Depression era theory of John M Keynes that in hard times government could get the economy moving again by “priming the pump” – getting consumer spending going again. In economist terms that’s the demand side of the economy. Milton Friedman argued in the 1970s that long term growth came from managing the investment potential of the economy or the cash available for investments. It seems like a reasonable theory in itself. Putting this into practice has been trickier. Since 1980 the theory has run that if you cut taxes for those with a lot of money most of it will go into investments, creating a larger pool of cash for expansion and growing stable businesses. Supposedly this works best when you cut the capital gains tax, or the rate of taxation on investment profits. This appears to have worked in the 1980s. It is entirely possible that a one-time cut in investment taxes will encourage money to go back into investment, but what about a permanent cut that never goes away? Rich people, like poor, who have extra money tend to spend it. In a completely liquid stock market the distinction between long-term capital gains and short-term trading evaporates quickly because anyone can move money in and out easily. So it is only reasonable that the decades of deficit financed tax cuts worked for exactly the reason that they were not supposed to – they encouraged demand just as Keynes said they would. We can see that in the 1980s there was a big bump in the net increase year over year, surpassing even the “good years” of the 1990s. 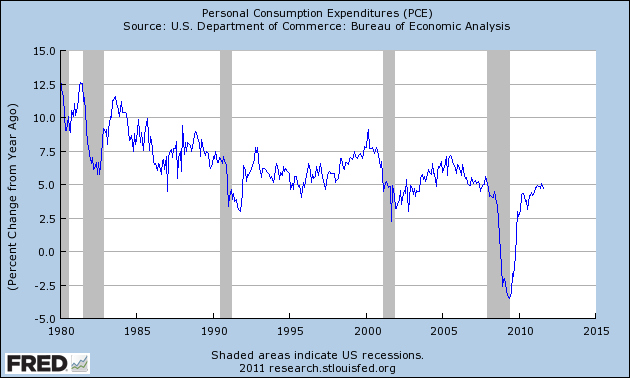 The net effect of the supposedly “supply side” stimulus was growth in consumer spending. Contrast that with today, where the net growth in consumer spending is considerably lower. The tax cut of the Bush years that were supposed to encourage investment and create jobs have not done so, as we discussed at great length previously. But making them permanent has not created a permanent growth in consumer spending, either. It’s become a spent force that is not doing a thing to stimulate the economy any longer – either for the reasons it is supposed to or the reasons it seems to have worked in the first place. That’s very consistent with what Keynes taught us. There is a big difference between a one-time “pump priming” and a sense of entitlement. More to the point, there is no shortage of investment money sitting in financial institutions looking for an opportunity. Thanks to the Federal Reserve, there is no shortage of capital – upwards of $2 trillion is waiting. But it is going nowhere. “Supply Side” makes even less sense in this environment. It seems to go without saying that the Federal Reserve does best managing the supply-side and the federal government the demand-side. If anything, those roles have been flipped right now. The result is inaction. What can be done about this? A paper by the San Francisco Federal Reserve (pdf) showed that the 2008 stimulus created jobs at a rate of $115k per job with about an 18 year payback against the tax revenue it took in. That’s an investment by any measure, even if you call it a Keynesian demand-side pump-priming or any other term that has seemed out of date since 1980. A different kind of stimulus in 2008, to create jobs, worked well in 2008 as far as it went. It’s hard to say exactly what a large Keynesian stimulus looks like after so many years of running one at great public expense. We’ve been running deficits for so long that an extra boost may not have the desired effect unless it is carefully targeted as an investment in our future – transforming the economy into one that is sustainable and equipped with the infrastructure it needs to grow. But those investments are fairly obvious and can be identified. Making them works – and has a real, definable payback period. The only thing that stands in our way is the will to make those investments, and the only things stopping that is the tired old idea that something called “Supply Side” is more efficient. It isn’t. It only worked to the extent it did the same thing we want to do now. Investment in the next economy, not the economy of 1980, is what it will take to get things moving again. To gather up the political will to make it happen the first thing we have to do is acknowledge that “Supply Side” is dead. This entry was posted in People & Culture, Politics. Bookmark the permalink. When I see Laffer on TV I get sick to my stomach. Saturdays: Glad to see you! I agree, it’s been a long strange trip – but times have changed. I only hope that solid Republicans become more engaged in the debate about what comes next and don’t simply keep insisting they are right because I do think that everyone has something to add as we move forward. It’s our nation, after all. We have to make it work for us. I never thought it made sense but I guess you are right that it worked because it was really another kind of “stimulus”. I know you are hot for this new economy thing and I don’t know that you are wrong but it seems to me that just about anything different is going to be more effective then the same thing that has not been working lately. The idea that it has to be temporary is a bit strange because if people don’t rely on it they may not spend it on something but save it instead. Creating jobs has to help though. Anna: We did create jobs in 2008 – just not a lot. We can do it again and make it work – but there’s no reason to try what we know doesn’t work anymore. That’s my main point. and I’ll stand by it. I think you’re right about temporary measures designed exclusively to goose consumer spending – those may not be as effective for the reasons you cite. Good blog, keep it up. We need more pressure to finally kill this stupid idea that never really worked. Thanks Dale – just trying to get some organizing tools out there for people to refer to. Didn’t even get into inequality, which is a whole ‘nuther post. If an economics-adverse dummy like me can reach this conclusion back in the eighties…how can otherwise intelligent people still not acknowledge its failure? Jack: First of all, you’re pretty sharp. Second of all, I think most people have known this stuff is hooey for a long time even if the media has let it go as if it was too controversial to take on. Lastly, you ask “How can otherwise intelligent people still not acknowledge its failure?” That is an interesting one. So many people ignore the obvious in the name of what they believe it utterly baffles me. Sure, I can do this too, but I make a point of not letting it happen too often. There’s a basic value at work here – truth has to win out over the personal. I think it’s an expression of selfishness more than anything. Strange theory, no? Perhaps (as others have already stated elsewhere), there’s a bit of cognitive dissonance involved? Tax reform under Reagan included indexing the tax brackets for inflation. This was a good political move. Not a good idea if no federal programs are going to go away. In the 1970s people were being pushed into higher tax brackets. There was lot of cost push inflation that had to be wrung out of the economy. COLAs, labor agreements…So I think lowering the marginal tax rates and indexing were the more important reforms. The lower marginal tax rates for income had worldwide consequences. More broadly speaking I think of supply side as including deregulation of the airline, trucking, railways, antitrust. I think those are accepted. Banking, labor and health and safety environment is still a right/left debate. Smithson: I agree hat was accepted, and I think there’s more to go on deregulation along many lines. The left rank-and-file has far less apetite for regulation than the leadership does. The big exeption is banking, which many people I know are getting radical about. Glass-Steagall redux is a hot topic anymore. Time marches on. The meaning of “progressive” is changing. But I think we’re getting somewhere. It’s all what we value.